It is widely recognized that large-scale long-term science collaborations deliver lasting benefits to participating nations. Most of these collaborations require large infrastructure. As is done in Europe, the coordination of resources for these large infrastructures among different countries in Latin America is desirable in order to optimize efforts. With the support of many countries and institutions, the initiative for a Latin American Strategy Forum for Research Infrastructure (LASF4RI) was presented at the Meeting of the Iberoamerican Ministers for Science and Technology last year, and was included in the final declaration that was ratified at a subsequent meeting of the Heads of State. 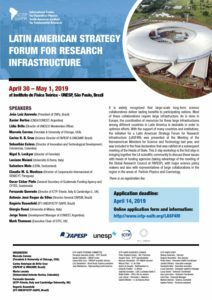 This 2-day workshop is the first step in bringing together the LA scientific community to discuss these issues with heads of funding agencies (taking advantage of the meeting of the Global Research Council at FAPESP), with major science policy makers and also with representatives of large collaborations in the region in the areas of Particle Physics and Cosmology. Registration: ALL participants should register. The registration will be on April 30 at the institute at 08:30 am.